The Zero Waste Reverse Osmosis Retrofit Kit is a great way to convert your existing Reverse Osmosis system into an efficient water saving device. By adding this kit to your existing RO system, you can save hundreds of gallons of water every year. The system works by redirecting the rinse water. This kit pumps the rinse water into the hot water side of your water supply instead of down the drain. With the use of the supplied 24 volt pump, your hot water supply will accept the rinse water and mix with the hot water. This process can be done because when you use your hot water under normal circumstances, the water coming from your hot water side is not used for cooking or drinking. Also by adding this kit to your existing RO system, you will be able to increase the membrane production and fill the storage tank faster.Specifications:Requires a 110 volt electrical outlet independent from the garbage disposal RO System must be a minimum of 25 feet away from the water heaterIn the Box. Eliminate noise created by the airgap faucet. NOTE: Will not work with a tankless water heater. A TDS meter (aka ppm pen, nutrient tester, TDS stick) is an inexpensive and convenient digital tool to instantly check your overall water quality. TDS stands for Total Dissolved Solids, which is any salt, metal or mineral in the water. With the push of a button, the TDS meter tells you your overall water purity level, which will be displayed on the screen in ppm (parts per million). The lower the TDS level, the purer the water, with 0 ppm being pure H2O.The TDS meter is great for checking your tap water quality and knowing when to change a filter. The TDS meter is a great tool for drinking water, water filtration and purification, colloidal silver, hydroponics (test your nutrients), aquariums, RO/DI systems, pools and spas, commercial and industrial applications and more. The TDS meter includes a protective carrying case. Pressing on the temperature button allows you to test the temperature of the water (allow 1-2 minutes for an accurate reading for the temperature compensation). What's included: One 5 micron sediment filter: With only a five micron rating, it is effective in removing dirt, rust and sand particle. One granular activated carbon (GAC) filter: Adsorbs chlorine, halide, organic contaminants, odors, and other impurities that contribute to bad taste and odor. One 5 micron carbon block filter: Removes any remaining chlorine and organic chemicals, further enhances the taste of water. One post carbon inline filter: This post carbon filter removes objectionable tastes and odors to enhance the quality of your drinking water. 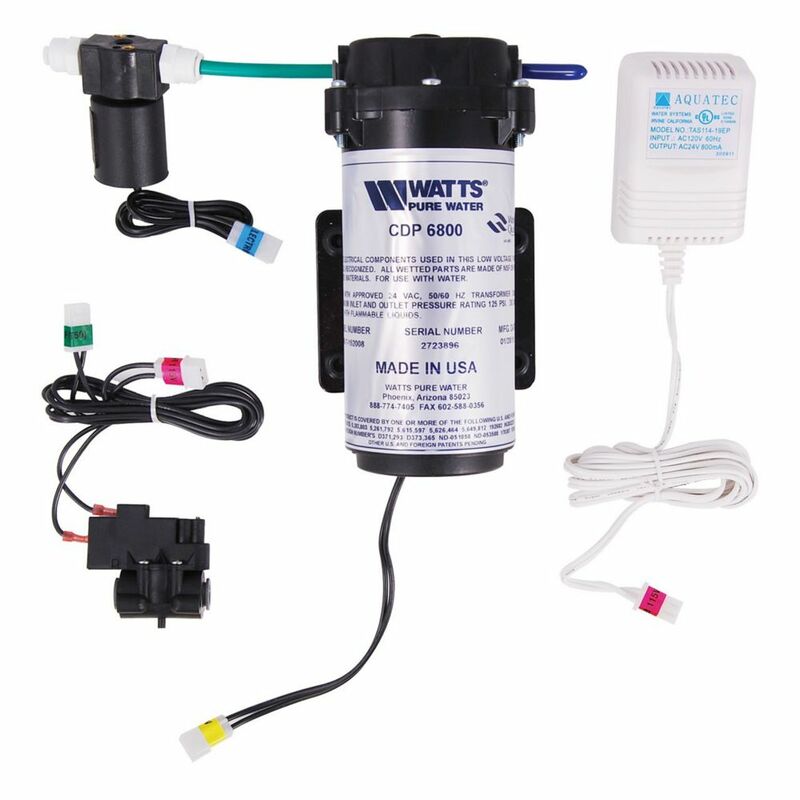 Watts Premier Zero Waste Retrofit Kit The Zero Waste Reverse Osmosis Retrofit Kit is a great way to convert your existing Reverse Osmosis system into an efficient water saving device. By adding this kit to your existing RO system, you can save hundreds of gallons of water every year. The system works by redirecting the rinse water. This kit pumps the rinse water into the hot water side of your water supply instead of down the drain. With the use of the supplied 24 volt pump, your hot water supply will accept the rinse water and mix with the hot water. This process can be done because when you use your hot water under normal circumstances, the water coming from your hot water side is not used for cooking or drinking. Also by adding this kit to your existing RO system, you will be able to increase the membrane production and fill the storage tank faster.Specifications:Requires a 110 volt electrical outlet independent from the garbage disposal RO System must be a minimum of 25 feet away from the water heaterIn the Box.